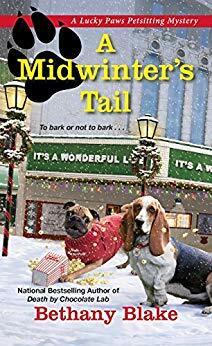 A Midwinter's Tail is a cozy mystery set in a small town in Pennsylvania. Daphne Templeton has a pet sitting business and a reputation for solving mysteries. When one of her old high school classmates returns and ends up dead, Daphne becomes involved in solving the mystery. This is my first read in the Lucky Paws Petsitting Mystery series. I have been missing a really fun series! I've put the other books on my reading list at Goodreads. After a chapter or so, I felt caught up with the characters and enjoyed this novel as a standalone read. 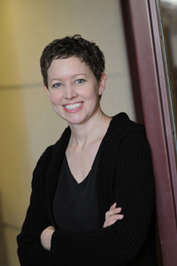 The author, Bethany Blake, loves animals and does such a great job writing about them. A Midwinter's Tail features a basset hound, a spoiled poodle, a cat, a playful chihuahua, a lab, a naughty pug, and a pet rat. The animals in this book absolutely stole the show for me -- great fun! There is a wonderful small town setting. Sylvan Creek, Pennsylvania was depicted in detail and was such a cozy small town. There was a fun romantic triangle. Daphne has two single men interested in her -- police detective Jonathan and small town newspaper writer Gabriel. I enjoyed seeing this triangle play out. There is an emphasis on friends and even a flashback to their high school years. Since much of the storyline involves the murder of CeeCee, who returns to Sylvan Creek after many years away, part of Daphne's detection involves researching old high school yearbooks. A Midwinter's Tail is such an enjoyable cozy holiday mystery. I recommend it highly to other cozy fans, and especially to anyone who loves pets. Thank you for your review on "A Midwinter’s Tail" by Bethany Blake and for being part of the book tour. Love this cover and can't wait for the opportunity to read the book!